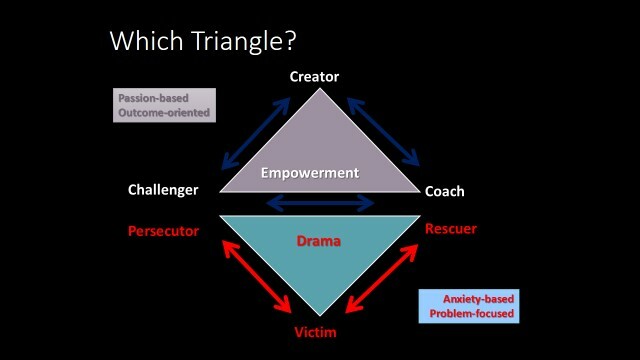 David Emerald has developed an alternative to the Drama Triangle which he calls the “empowerment dynamic.” It involves the substitution of the roles of persecutor, victim and rescuer with healthy alternatives which are accompanied with rational thoughts that substitute for the cognitive distortions that support the roles of the Drama Triangle. These healthy roles and thoughts produce positive emotions and behaviors. Instead of fear-based action they generate behaviors that are motivated by creative passion. Ideally, the empowerment dynamic generates behavior that is solution-focused in relationship to behavior within the Drama Triangle, which is problem-focused. The Persecutor evolves into the “Challenger” who thinks, “You can do it!” They see all of life’s challenges as opportunities for growth. Challengers ask themselves, “What is my intention?” instead of assuming they know what is best or right. Instead of putting others or themselves down they build up and gather new, helpful information. They recognize and speak to the potentials in others, often unrecognized. Challengers produce clear structures and guidelines for accomplishment. They challenge by asking, “What do you want to do?” “Who do you want to become?” “What are you committed to?” “You aren’t doing what you said you were going to do; what are you going to do about it?” They think, “I can hold others to a high standard because I see the best in them, and I can do it in a way that is kind, thoughtful and empowering.” Challengers state boundaries such as, “We are agreeing not to interrupt or change the subject.” Challengers listen without personalizing; you do not take on the problems of others and make them your problems. Challengers make expectations clear: “I want you to keep your agreement. Please have it done by our next meeting.” They provide choices: “If you cannot keep an appointment you can call to reschedule with 24 hours notice or you can pay me for the missed appointment.” Challengers generate feelings of security, respect and trust and behaviors that are responsible and clear. They call forth learning and growth while provoking and evoking conscious and constructive action. The Victim evolves into the “Creator” in Emerald’s system, a role that is also an “achiever” or “evolver” who thinks, “I can do it!” “I am capable!” Evolvers state what they want, create a plan, follow it and take action to achieve their goals. They keep their agreements, which means they also learn not to over-commit. Evolvers ask themselves, “What do I want and what do I need?” “How can I get what I need in a healthy way?” “How can I move from reacting to responding?” They think, “I am moving ahead in my life.” “This is what I’ve learned.” “I can make my own decisions and create a life I desire for myself.” “I can hold myself to a high standard without being critical and pressuring, perfectionistic, or thinking that makes me better than others.” Evolvers remember what they have to be thankful for and focus on their strengths, not their weaknesses, limitations and failures. Evolvers ask for help from coaches, not rescuers, meaning that they not only know the difference but recognize that rescuing will only keep them stuck. This generates feelings of empowerment and behaviors that are satisfying because they move Evolvers one step closer to their goals. Evolvers own their power to choose and respond rather than react. They focus on outcomes and solutions rather than on problems. The Rescuer evolves into the “Coach” who says, “I care about you and I know that you are capable.” They ask themselves, “How am I seeing this other person, as a victim or evolver?” Coaches don’t do for another person what they can do for themselves. This is not a failure of generosity but rather a statement of confidence in the ability of the other to think, figure things out and take action. Coaches say, “I know you can do this.” “What are your next steps?” “What do you need in order to achieve them?” Coaches support and assist, facilitating the development of clarity by asking questions, and asking, “How will you do it?” They provide choices while focusing on solutions rather than problems. This generates feelings of confidence and behaviors that are effective and successful. All three of these transformed, constructive roles combine into an identity that becomes increasingly transparent. Life is not about you and your interests but increasingly about what life wants and how you can help yourself and others get out of the way so that life itself can evolve as it moves into a fuller expression of its infinite potentials. More about the Drama Triangle and how to escape it can be found in posts on this site and in Waking Up by this author. Next PostWhere are you going with your life?